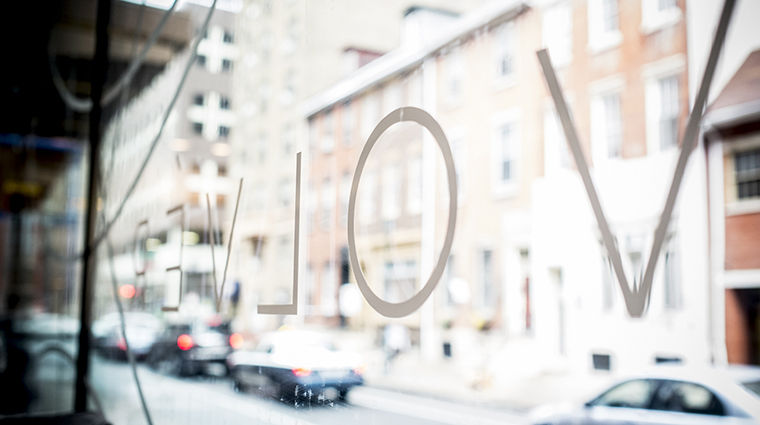 While Philadelphia has its share of fine-dining establishments, Volvér brings in a much-needed element: diversity. 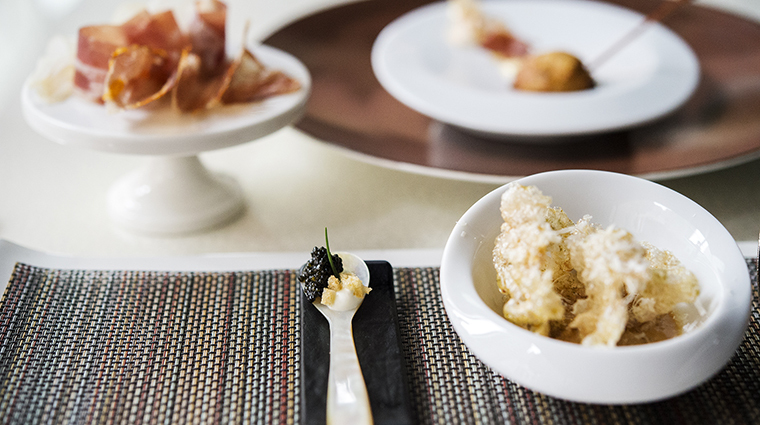 Celebrity chef Jose Garces takes you on a prix fixe journey through cuisines from all over the world in the intimate restaurant located inside the Kimmel Center for the Performing Arts. 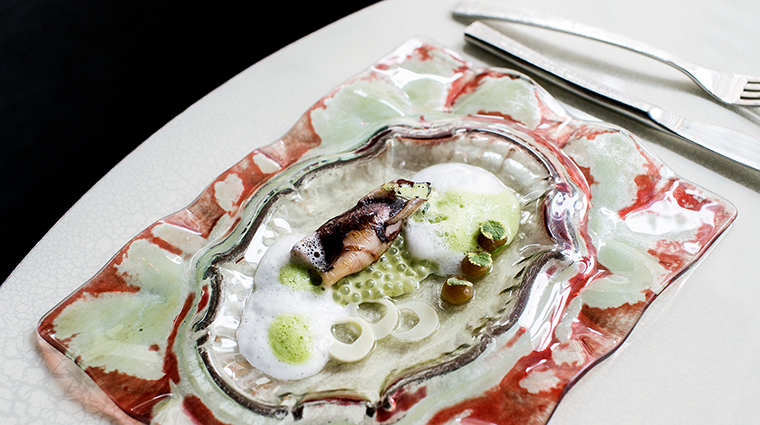 Volvér, meaning “to return” in Spanish, offers a culinary meditation and represents Garces’ return to his most influential culinary experiences across the globe. 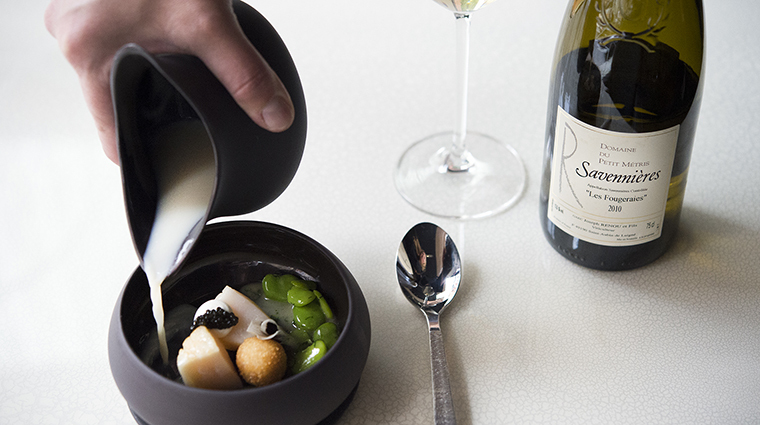 While the menu has experienced some structural changes since the restaurant’s opening in 2014, today Volvér serves a 10-course seasonal tasting menu with optional wine pairings, of course. With only 34 seats overlooking an open (and remarkably calm and quiet) kitchen, Volvér is an intimate dining experience with top-notch, highly personalized service. 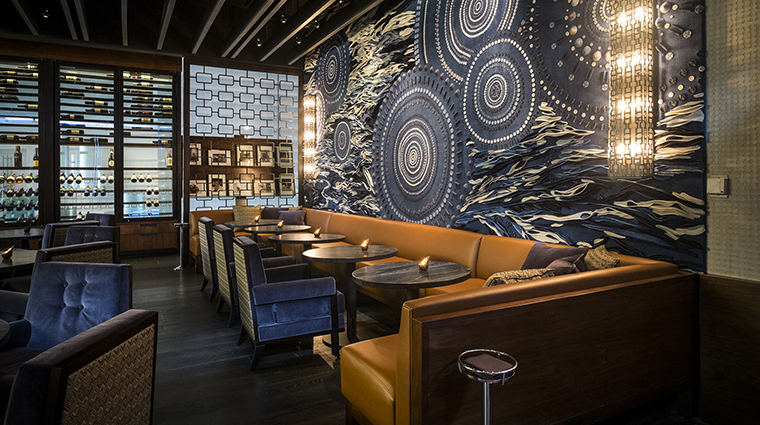 Volvér boasts a contemporary décor designed by architectural firm KieranTimberlake and designer Marguerite Rodgers. 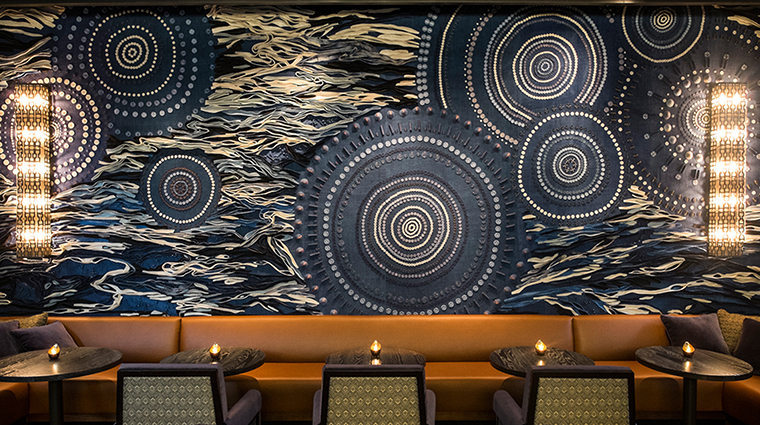 Light floods through the walls of windows overlooking Spruce Street, highlighting a custom-made textile art installation from Philadelphia-based artist Conrad Booker that anchors the setting of Bar Volvér. 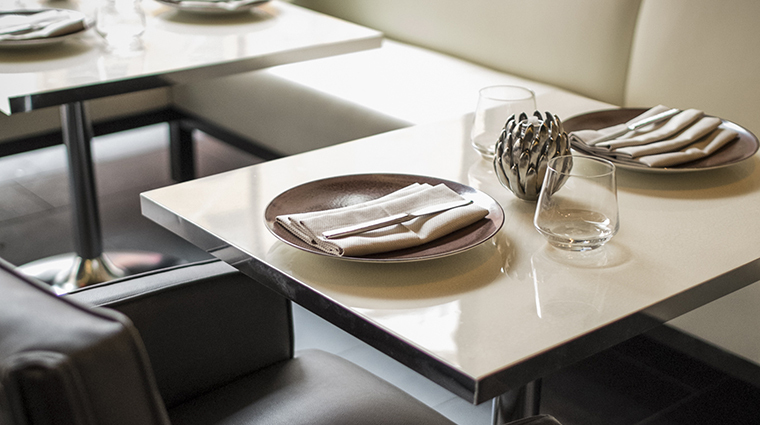 Attention to detail and high-quality design are reflected in the serviceware as well; the Avenue of the Arts restaurant employs Schott Zwiesel glassware, Guy Degrenne cutlery and Bernardaud china for its tasting menus. Adjacent to Volvér, Bar Volvér provides an inviting setting for a pre-dinner cocktail or a light bite prior to a show at the Kimmel Center. A regular fixture on television, Garces is one of only eight chefs in the country who holds the title of Iron Chef, and he frequently appears on Iron Chef America, having won The Next Iron Chef. The full wine list, curated by sommelier Gordana Kostovski, is also available at the bar; peruse an extensive selection of more than 1,500 bottles and 20 wines by the glass. Reservations are recommended at this posh Philadelphia restaurant. Book your table on the eatery’s website or by calling 215-670-2302. Indulge in global cuisine at Volvér Tuesday through Thursday from 5 until 9 p.m. or Friday and Saturday until 10 p.m. The fine-dining establishment is closed on Sunday and Monday. The menus span the world while also showcasing regional specialties, including locally raised meat, poultry and seafood, as well as produce from Garces’ Luna Farm, a sustainable, organic 40-acre plot in Ottsville, Pennsylvania, named for his family’s dog. A recent visit to the Philadelphia restaurant included such dishes as chawanmushi (a Japanese egg custard) with teriyaki-glazed shortrib, an Ecuadorian-style ceviche with tomato gelée and popped sorghum; and John Dory with crispy cabbage, roasted potato crema and caviar. One menu item that’s been on the bill of fare almost from day one, however, is the signature “Milk & Cereal” — Garces’ playful riff on the breakfast staple, which features bacon, glazed chicken, black truffles, rice flakes and thyme-flavored marshmallows served with a carton of warm asparagus milk. The whole dish is eaten with a spoon, evoking a childhood memory, albeit for a grown-up palate. 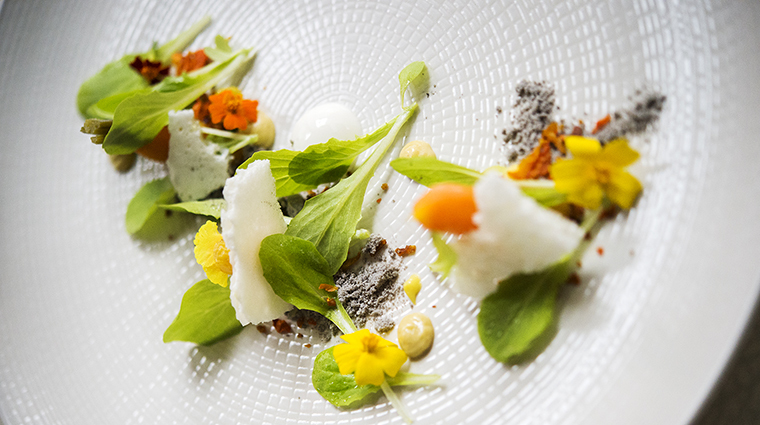 With seven restaurants dotted across the City of Brotherly Love, his home since 2001, Garces is arguably the king of the Philadelphia restaurant scene, although his culinary philosophy reflects both his Ecuadorian heritage and a myriad of global influences. A graduate of Kendall College’s School of Culinary Arts in Chicago, he honed his craft in New York and abroad. Today he owns and operates more than a dozen restaurants under the Garces Group name across the East Coast from Atlantic City to New York. Recognizing Garces’ culinary achievements, the James Beard Foundation named him Best Chef, Mid-Atlantic in 2009.